Step 1: Go to the Google+ website. All sign ins for any Google application are all one sign in. If you have a Google account, sign in, if not, click on Create an account at the bottom of the page. Step 2: You will be taken to a screen called ‘Create a new Google account’, where you need to fill in your Name, preferred Username, Password, Birthday, Gender, Mobile Phone and Other email address. You will also need to agree to Google’s terms and conditions. Follow the on-screen instructions. 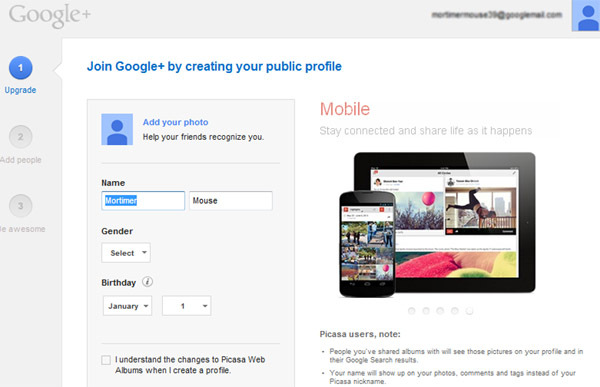 Step 3: When you have set up an account with Google, continue to sign into Google +. 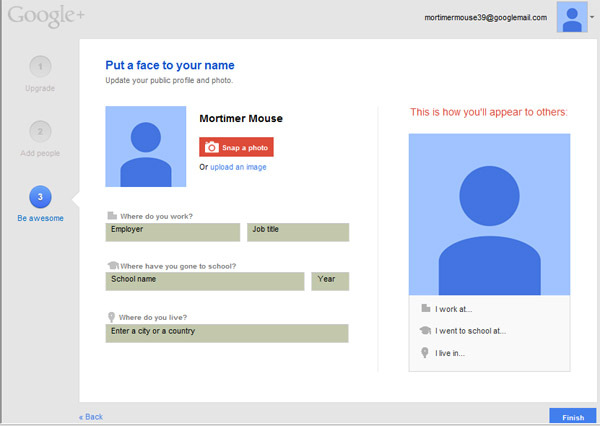 Step 4: When you first log into Google+ you will need to setup a profile to get the best out of the utility. Click on Create Profile. Step 5: Complete your personal information and a username that everyone will see. Click Upgrade. Step 6: On the next page, Google+ will ask you if you want to add anyone that it thinks you might know to your friends list. Complete if you want to, otherwise just click Next. Step 7: The next page then ask you if you want to follow other pages that might interest you. Again, choose if you wish or click Continue. It may prompt you if you don’t pick anything at this point, but continue anyway. Step 8: You now have the opportunity to add a photo to your profile. You can either Snap a photo with your webcam or you can upload a photo from your computer. Click on your choice and follow the onscreen prompts to upload your picture. You can see how you will look to the outside world from the preview in the right hand side of the screen. Step 9: Once you have uploaded a picture you may also like to complete further information about yourself such as where you went to school or where you work If you don’t want to complete this, just click Finish. Step 10: You are now ready to start using Google+.